Memoirs can be written for a variety of different purposes. What do you think motivated Conway to share her life story? How did you respond to her “voice”? Was there something especially surprising about her story? What was it and why? Discuss the book’s structure and Conway’s use of language and writing style. How does she draw the reader in and keep the reader engaged? Were there any instances in which you felt Conway was not being truthful? How did you react to these sections? Explain the dynamic between Conway’s parents differing (a) geographical upbringings, (b) social class, and (c) religion and how it affected their lives together. How did the drought at Coorain affect Conway’s father? How does it relate to his death? How did Conway’s mother handle her father’s death? To what extent was her response unhealthy? How did Bob’s death affect Conway? Barry? Conway’s mother? In what way did Conway have an unhealthy relationship with her mother? What is Conway’s most admirable quality? Is this someone you would want to know? Why did Conway decide to leave her mother in Sydney and go to the United States? How did Conway figure out that she was going to study history? Was there a lesson could be taken away from her life? What was it and why is it important? 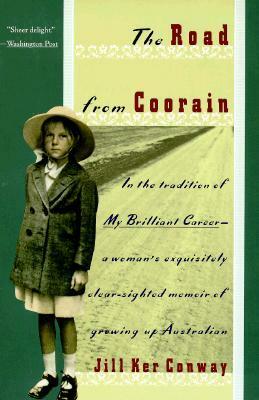 Compare this book to other memoirs the group has read. Is it similar to any of them? Did you like it more or less than other books you’ve read? What do you think will be your lasting impression of the book? What did you like or dislike about the book that hasn’t been discussed already? Were you glad you read this book? Would you recommend it to a friend? Do you want to read more works by this author?